Oh, hello there! I just finished a classic novel featuring a pretty awesome mom character, so even though I’m a few days late for Mother’s Day, I thought I’d put together a list of the literary mothers who, in my opinion, embody great maternal instincts. As James Joyce once wrote, “Whatever else is unsure in this stinking dunghill of a world a mother’s love is not.” And that is true for all of the women on this list: they love their children. Some of these women are kind and nurturing, some of these women are fierce and protective, and some of them are difficult and dramatic, but they all share one important role: when it comes right down to it, they’d do anything and everything for their children. Although Marmee can come across as somewhat saccharine to a mature reader, to a young reader the March girls’ sweet mother embodies everything a mother ought to be. She nurtures and cares for her gaggle of girls while her husband is away fighting in the Civil War, with little money and few resources. She shapes her girls’ educations around her own strong moral code, and unlike some mothers on this list, never encourages them to marry for money. And all this without a frown or unkind word! Patience, thy name is Marmee. Hazel doesn’t always have the kindest thoughts about her mom; Mrs Lancaster is kind of the definition of a helicopter parent. But can you blame her? Her only daughter is slowly dying of cancer. She has given up nearly everything else in her life to become a stay-at-home mom for Hazel, taking care of all the medical details while also acting as emotional and social support for her ailing daughter. Mrs Lancaster goes out of her way to make celebrations big, to encourage Hazel to make the most of each day, and to be unafraid when facing the short time she has left. Go Mrs L! Garrulous, self-absorbed and socially inept, Mrs Bennet wants nothing more than to see all five of her daughters married off to men with at least five thousands pounds a year. She spends a good portion of the book whinging, kvetching, and generally getting on everyone’s nerves, but beneath Austen’s humorous and somewhat insulting characterization is a mother deeply anxious for her children’s futures. If only she could realize that all her plotting is doing more harm than good! Although technically a stepmother to Cassandra, Rose, and Thomas, Topaz is artistic and kind and competent and hard-working and a little bit mad. Her favorite pastime may be communing with nature while wearing nothing but a pair of wellies, but she also goes to bat for the Mortmain girls time and again, counting pennies and sewing crinolines and dyeing old tea-gowns so that they might have a shot at a better future. And all this while putting up with Mr. Mortmain at his most ineffectual and Rose at her most noxious, in a crumbling, dripping ruin of a castle! Phew! Go Topaz! Molly Weasley ought to be sainted: she raised seven children in a rambling, magical house with barely any money and no help from her absent-minded dolt of a husband. And when she meets orphan Harry on Platform 9 3/4, she wastes no time in taking him under her already extended wing. When she discovers Harry won’t receive any gifts at the holidays, Molly knits Harry one of her famous sweaters, and continues to send one every year afterward. But aside from being a generous surrogate mom to Harry, Molly is also a staunch defender of good, a fearsome opponent in battle, and a furious protector of all her children. 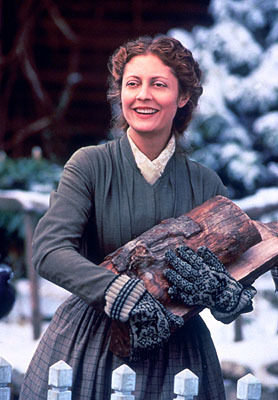 Who are your favorite literary moms? Share your thoughts in the comments below!